Well. I had not set out to watch this one, but it was on TV, I was looking for something Halloweeny to watch, but not a horror flick cause the kids were still up. I landed on this. Now, unlike some of the other movies that I have seen more than once I have seen this one something like a dozen times. It is one of the favorite movies of both my dad and my father-in-law. Anytime I have visited either of them in the last 20 years I was running a good chance of seeing it again. My dad had it on old VideoDisc and my Father-in-law has it on VHS, DVD and BluRay. Watching this now, especially since I have recently watched the Universal Frankenstein, gave me a totally new perspective on this movie. First off I will say it. Mel Brooks is a genius. He really is. He captures every cliche of the 1930s Horror films and turns them up to 11. No. 15. Plus there is always fantastic social satire of the times. This movie pokes as much fun at 1930s films as it does about the 1970s. Back to the movie. It plays as sequel to any of the Frankenstein moveis of the 30s and 40s. The cast is fantastic. 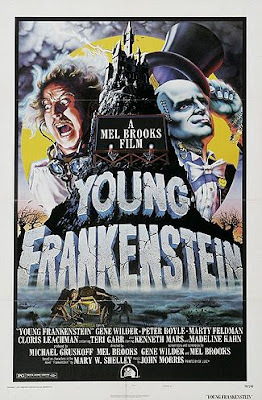 Gene Wilder in the titular role ("That's Franken-STEEN!!") and Peter Boyle as the Creature. Along the way we pick up Marty Feldman as Igor ("Eye gore") and Cloris Leachman as Frau Blucher. Teri Garr and Madeline Kahn also join the cast as a love interest and the fiancee of Victor. If you ever have seen a Frankenstein movie, then you have seen this one, at least in terms of plot and pacing. But this one goes over the top with comedy and is very close to a Brooks masterpiece. Only Blazin' Saddles might be better. There is so much here for the horror fan to enjoy. Brooks is indeed a genius, but Wilder shares the writing credit here, and apparently bristled enough at the praise being focused on Brooks that the two had something of a falling-out after Young Frankenstein was released. I'm not sure how the various elements and gags parse out between the two, but I have heard that Wilder fought to keep the "Puttin' on the Ritz" number in, while Brooks wanted to cut it as an aimless digression.